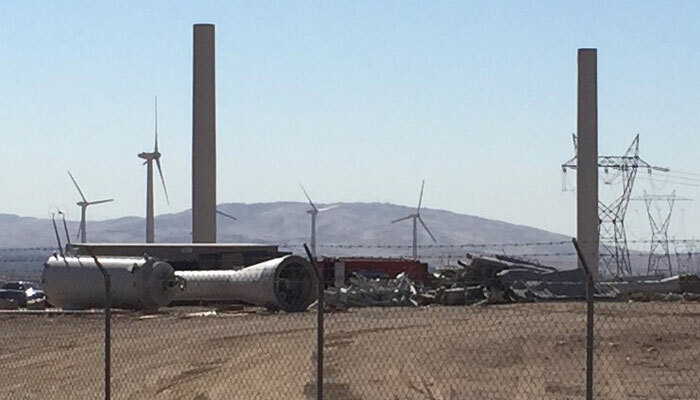 More photos of the Ogin ducted wind turbine dismantlement have been “thrown over my transom.” These close-up photos show far more detail of the disassembly and scrapping process than before. Ogin’s Diffuser Augmented Wind Turbine or DAWT is a direct descendant of FloDesign’s ducted turbine announced with much fanfare in the tech and popular press in 2008. The US Department of Energy’s Arpa (Advanced Research Projects Agency) was hyping FloDesign’s “innovative” wind turbine by saying it “could deliver 300% more power than existing wind turbines of the same rotor diameter by extracting more energy over a larger area.” Elsewhere, FloDesign was telling the media they could do all this for 30% less cost than conventional turbines. Since then FloDesign erected at least one prototype on Deer Island in Boston Harbor. Subsequently the design was moved to Ogin for development. 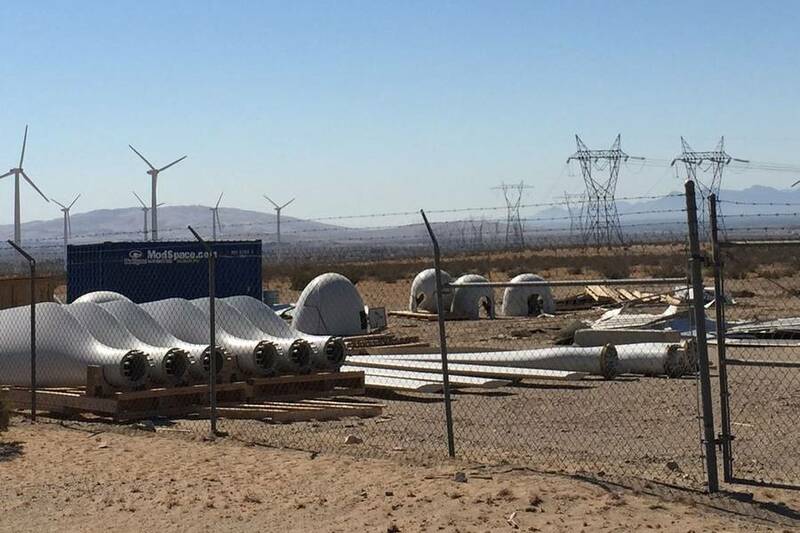 Ogin installed one prototype in the Antelope Valley on the flanks of the Tehachapi Mountains. See FloDesign-Ogin Diffuser Augmented Turbine (DAWT) in the Wild. 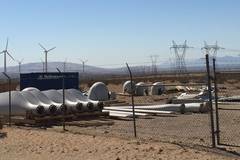 Early in 2016 Ogin installed several turbines at a site west of Indian Avenue in the San Gorgonio Pass. 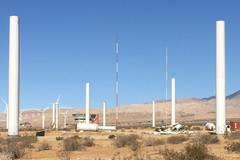 See Ogin Installs Ducted Turbines in the San Gorgonio Pass. 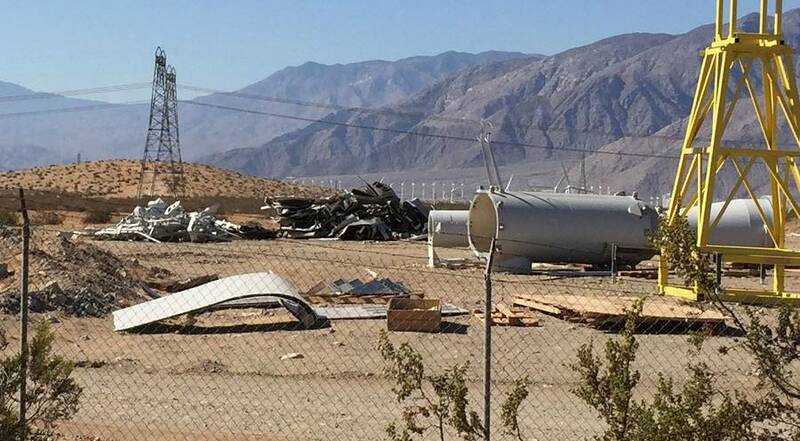 However, after less than six months the turbines have been taken down. Why is unknown. Ogin did not return my phone call for an explanation. 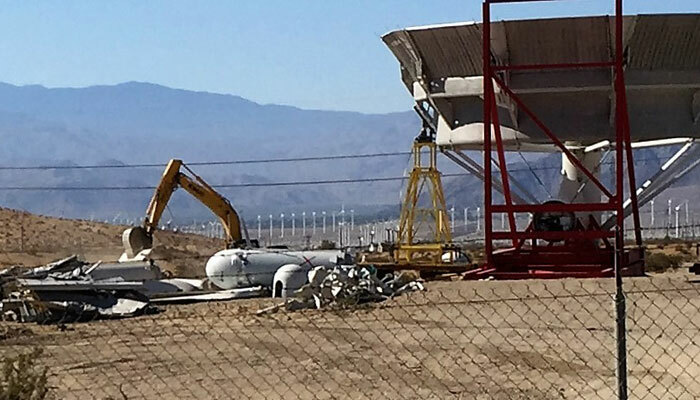 Now we have close-up photos of the site. 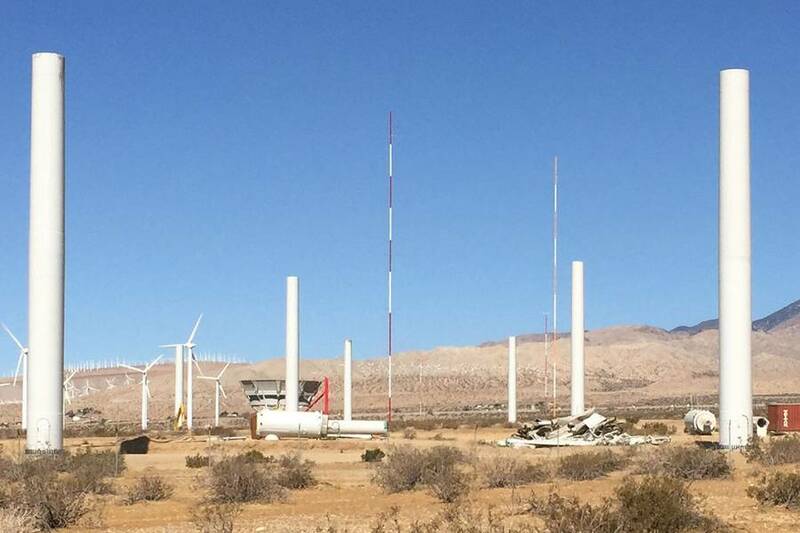 The towers remain standing but the prominent ducts have been removed as well as the nacelles. There are piles of fiberglass scrap, likely from the duct. One nacelle shows a large X as though it too is to be scrapped. There are also two sets of rotor blades: one set using the classic Hütter flange, and another set using the more modern bolt pattern. There is a back hoe on site. FloDesign/Ogin was backed by politically connected big name venture capitalists Kleiner Perkins. The New Zealand pension fund has a $55 million stake in the company. The province of Alberta and the state of Massachusetts have also invested in the company. Portions of this article have been adapted from the forthcoming book Wind Energy for the Rest of Us: A Comprehensive Guide to Wind Power and How to Use It.